I happen to have an extra fan left over from my recent "Chantelle" doll that I created. It is slightly darker than the one pictured. Please post this giveaway to your blog! When the followers get to 200 I will give the fan away and post a new giveaway in celebration! Please just leave a comment letting me know you want to be entered. CIAO, GINA!!! METTO SUBITO IL LINK NEL MIO BLOG....NON VOGLIO PERDERE LA FORTUNA DI POTERMI ASSICURARE QUESTO DELIZIOSO VENTAGLIO! Wonderful giveaway! I put the link on my blog. Que bonito es el abanico, yo también me a punto al concurso, y te pondré en mi blog, chaoo. Bueo ya tienes otra seguidora soy mercedes sonrisas,me ha encantado tu blog que no conocia y el abanico me parece precioso,asi que estoy deseando participar en tu sorteo y saber la fecha.No tengo blog te dejo mi correo por si la suerte me acompaña: correo mercedesmayo61@yahoo.es. I'd love to take part in your very lovely giveaway. I'll put your link on my blog. Un regalo precioso!!! Me encantaria participar, ya tienes una nueva seguidora y lo anuncio en mi entrada de sorteos!!!! Hola Gina, ese abanico es una hermosura, me anotas por favor en el sorteo? Que3 bonito es y que tono tan elegante, me encantará participar en tu sorteo. Subo el enlace a mi blog. Ohhh... was für ein schöner Fächer. Please count me in and you can see your picture on my blog. es muy lindo cuenta conmigo por favor y gracias por la oportunidad ! What a wonderful fan. Please count me in. I'm your follower for long time and your link is on my sidebar. Que regalo mas precioso!! me gustaria participar en tu sorteo, te anuncio en mi blog. Bonito, bonito, me encantaría poder tener ese abanico, lo anuncio en mi blog. Besos. Ohh! Lovely this giveaway!! I'd like to participate in it. I put your link on my blog. P.S. your dolls are very beautiful!!! I've just posted your link on my blog. Hi Gina, I've just joined up to follow your blog. I think your fan is absolutely gorgeous and would be thrilled if you would include me in your giveaway. Such a beautiful fan. Count me in. I love your dolls so vivid looking. 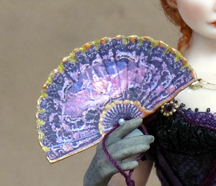 What a gorgeous fan - so detailed. I'd love to win it. Have just started following your blog. Very inspiring! Falta poco para lograrlo, me encantaría participar. Gracias lo anuncio en mi blog. I am a new follower! Your fan is very Beautiful! I would love to be in your giveaway! Sono una nuova follower....ho scoperto oggi il tuo blog.....bellissimo!!! Partecipo al tuo giveaway e metto il post nel mio blog!!! Se ti fa piacere vieni a trovarmi!!! Hello Gina, I met your blog today and everything is very beautiful. Congratulations! Now I am your follower and I'd love to participate in your drawing, I will advertise on my blog. Kisses in your heart. I'm a new follower. You can count me in to your giwe-away :) The fan is amazing! Hi~ I'm also a new follower~ Looking at the photos of your new doll, it really amazes me at how realistic it looks! So far from my blog hopping, I haven't seen any site that aims at the same niche, and that's super unique! Thanks for the chance in your giveaway~! Well done I love your blog. I am a new follower. Your fan is beautiful. Count me in for your lovely give away. Hay girl, how do I get a link put on my blog to yours? If you don't mind of course. Love the little fan, I have to see what else you are doing these days. El abanico es una preciosidad y me encantaria poder participar en tu sorteo . Hi! I'm a new follower and I love your blog. Please, count me in your give away. I'll put in my blog too. Hugs. What a beautiful fan. I wish I could win the doll too! Please count me in. Ill put a link on my blog. What a beautiful fan. Please count me in your giveaway. Thank you. C'est un magnifique cadeau et un tel bonheur si je pouvais le gagner!!! J'ai mis le giwe away sur mon blog. Hi Gina! Love to participate in this gorgeous give away! Please, count me in. I put the link on my blog. I've been a fan of yours for several years. Please count me in! Me gustaria participar en tu sorteo,es un regalo precioso,besos Auxi. Such a pretty fan, can't hurt to say so...count me in. I´m new follower in your blog. I see all the pretty things you made. Congratulations!!! Please count me on your giveaway. Kisses. Hello! I would like to participate!!! ORA MANCA UN SOLO FOLLOWER!!! SONO PENULTIMA, MA SPERO DI ESSERE VINCITRICE DI QUESTO MINI-VENTAGLIO MOLTO FASHION!!! Found you via Doll Artist Workshop on FB. Your dolls are wonderful! Would love to be entered in the giveaway. Geweldig je giveaway wil graag meedoen,ik ben al een volger van je blog. Hi Gina, I would like to be entered in your giveaway!! Your teen doll is also gorgeous!! !